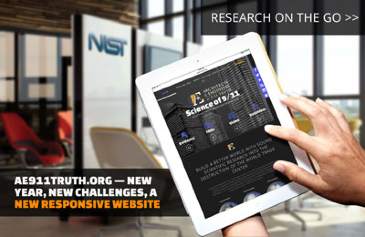 Earlier this month, we put the finishing touches on our new website — one that will take us into 2015 and beyond! Today, as we launch our 2015 Membership Drive, I invite you to visit the new website — and then, if you haven’t already, please consider becoming a sustaining member of AE911Truth for as little as $2.50 per month. During last year’s annual membership drive, we welcomed over 1,000 new members into the AE911Truth family, allowing the organization to grow and professionalize significantly. Our goal this year is to equal that number — because we must accomplish even more in 2015 if we are to reach the tipping point that motivates us all to keep on working. Unlike so many other research and education organizations, AE911Truth does not have the luxury of relying on the support of large foundations and wealthy individuals. Instead, we count on thousands of supporters like you giving just a little bit each month. By harnessing your collective support, we are able to mount a serious and organized effort to turn the tide of public opinion toward a new WTC investigation while the window of opportunity remains open. If your heart is behind what we do, then please consider joining us now as we strive to accomplish even more in 2015. History is counting on us.